I was just finishing up with my post-workout ice regimen when a helicopter buzzed the house. It sounded much meatier than the usual news chopper or police bird. And lower. The windows rattled and the walls reverberated, then the sound faded. Only to return a couple of minutes later. On the third pass I went outside to see what was going on. That’s when I saw the smoke. There is a hill directly behind our neighborhood, and it was on fire. Over the throb of the helicopter, I could hear the fire itself, crackling as it romped through the dry grass on the side of the hill. No sirens, however, despite the proximity of the fire to my neighborhood. The brush is pretty low, and there are railroad tracks along the back of the property, so the chance of the flames reaching structures on our side was pretty low. So rather than prepare the two hard drives that serve as backups to all our systems, I grabbed the camera and walked down to the fence at the back of the neighborhood. Happily for the helicopter driver, and for spectators on the sidelines as well, there is a little pond right next to the site of the fire. I got some good pics, but the helicopter descended completely out of view during fill-up. The helicopter rises from loading at the pond, shrouded by smoke. The helicopter getting a load of water, with a lucky accident as the camera focussed on the fence. The above pictures I got while standing on a neighbor’s boat, in exchange for a promise to share my pictures with him. Then he told me a house number that doesn’t exist. Huh. Anyway, thanks, Steve! The chopper drops a load of water directly upslope from firefighters. The Helicopter would sound a siren just before releasing the water, to warn crews below. In this case, the water almost directly onto the ground crew. 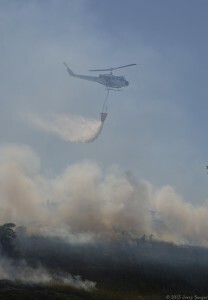 The fire helicopter passes directly overhead after releasing a load. At one point the fire flared up right next to the tracks, and the helicopter diverted and dropped a couple of bucket loads right in front of us. I have video, but I’m still working on getting it in the right orientation. An exciting day! I hope none of the firefighters were hurt, but hats off to guys who will put on heavy clothing and go tromping up and down a grassy slope that’s on fire. Thanks, guys! I’m not going to point fingers, but someone in this bunch isn’t giving 100%. Now you can share in the Christmasy fun and support two worthy charities at the same time! You are all familiar with the Salvation Army, and they get a chunk of dough for each pack of cards sold. The other beneficiary is a group called Pinup Angels, who will use the money to send care packages to troops serving overseas. The first way to help, obviously, is to buy cards. A pack of 20 cards goes for only $15 – a ridiculously low price if you ask me. All we need is a shipping address and an email address. We will bill you though PayPal (no PayPal account is necessary) and send you your cards. It’s easy! If you’re old-fashioned or the name “PayPal” makes your head rotate 360 degrees, I’m sure we can work out alternate payment, but the system really is pretty seamless these days. Shipping is free in the US. For Canada, add $1US for the first pack and $0.50US for each additional pack. For European shipments add $3 for the first pack and $0.90 for each additional pack. Here’s the link to the official Web site, with contact information and whatnot. Order your super-awesome cards and start feeling good about the holidays. Here’s a shot of the set (without lights). Can you guess what the theme is? Did a photo shoot with Cricket LaFaux last night. At some point I’ll show you some of the pics. Here’s the living room at the end of the evening. Harlean Carpenter (who is a fiction) has a photo entered in a contest at Pinup Lifestyle. It’s a pretty cool picture. The winner is decided by public vote, and while there is some pretty strong competition, it’s realistic to think she has a shot. I (who is less of a fiction but not entirely real) took the picture, and I think it’s easily the best photo not taken in a professional studio with real photography lights. The theme of this month’s contest is circus/carnival (or something like that). Some of the entries aren’t really on-theme, but a few really do capture the theme in a pinup style. The thing is, judging by last month’s winner, it’s not always the best that wins. It’s the one that gets the most votes. Don’t let this injustice happen again! Pop on over to Pinup Lifestyle, vote for my fictitious friend, and then hang out a while to look at the other excellent photos (borderline safe for work). While I haven’t managed to separate my brain from my work long enough to get fiction flowing, I did manage to take time out to catch a Halloween shoot with Harlean Carpenter, self-created fiction. Here are a few of the shots. Enjoy! The rest of the gallery can be found at Poetic Pinup. Take a look! Since I don’t have much to say, really, what with my brain being off in technology-land, I thought I’d share the result of this week’s Self-Portrait Friday. I have not been consistent with this tradition at all, but today I grabbed the camera and shot myself. In case you haven’t picked up on this, most of the pictures in this blog can be expanded by clicking on them. Not that there’s much reason to in this case, but there you go. I’ve been pretty busy for the last week, coming up to speed on the project, fixing bugs, and generally stressing over the fact that I failed to provide instant lift. I always provide instant lift. Not this time. While I was familiar with all the tools used in this project, putting them all together at once was a lot to assimilate. So I’ve been sitting in this chair, typing on this keyboard, but not doing much to advance the Media Empire. I have busy fingers, however, and I will always find something on my desk to fiddle with while I’m thinking. On day one of this project my sweetie brought me lunch at my desk, gave me some words of encouragement, and left me to mutter at the screen. One of the items in my lunch was a little round of soft cheese, wrapped in red wax. I love those things. The dumbbell-shaped one was the most recent; I’m breaking out of the simple geometric mold. What will be next? There’s nothing like putting one’s feet up after a long day counting your gold and precious gems. I have in the past posted several episodes with photos of what I called “Rock Stacks.” It turns out that most of them were not stacks at all. What I have been doing all along is Rock Balancing. I discovered this while checking the Search Engine hits that brought people to my blog. Occasionally “Rock Stacking” generates a hit. I decided the check some of the other matches, and came upon this page, which discusses the difference. The same search linked to an episode here at Muddled Ramblings called The Man is Keeping Me Down. I’m not unhappy about being wrong. I have long tried to differentiate my delicate and transient works from the cairns and other piles that the kids are doing these days. I like their stacks, but the goals of the two crafts are different. Stacks are very much about the setting, and as you can see if you follow the above link, there are some pretty nice ones. From now on, therefore, I will adopt the correct nomenclature. I do have one thing in common with the stackers, however. Most rock balancers create spires with three rocks, while I’m rarely content with that. Three rocks is relatively simple: base, left hand, and right hand – fiddle and nudge until everything is stable. It’s the rock you put on top of that mess (or if you use rocks too big to manipulate with only one hand) that really makes the thing. As a result many of my favorite efforts have come out something of a hybrid between stacking and balancing. Ultimately, however, it is the impossible-seeming, gravity-defying balance that I like the most. An incomplete spire, but the tiny contact zones that make it interesting are lost in the background jumble. While I’m on the subject of rock balancing, while on the cruise my partners in crime and I did some pretty sweet balancing of whatever items were handy. Naturally some of the items were glass, which makes the result more interesting and also makes the crew of the boat more nervous. Add in waves and you have yourself a party! I don’t have any pictures of the results (I was busy stacking balancing after all, and one of the stacks balances(?) included my camera), but others took pics. I’d love to link to those pictures here, if people will send URL’s. Also on the boat was a guy who is way into 3D photography. He showed me how ridiculously simple it is to take 3D shots (the hard part is viewing them). One of the key things about 3D is that it really helps separate the subject from the background. Many of my old rock stack balance spire photos suffer from the rocks being exactly the same color and texture as the background. Boy, 3D would make those pictures better. If you poke around at Rock on, Rock ON! you will see some really good balancing (better than I have pulled off to date), including one 3D shot.